until the morning when I get closer to civilisation. The day began well with a six a.m alarm and I was out of the ludicrously expensive hotel by 0645 - they didn't even do a continental breakfast unlike just about every other hotel I have stayed at. I rode half a mile down the road to a restaurant attached to a Quality Inn and wolfed down a big bowl of oatmeal (porridge) and then made tracks. Today's target was just shy of 70 miles and I had knocked out the first 33 miles by about 1130 when I stopped at Grandma's Cafe, a truck stop in the otherwise empty town of Lamont. Since it wasn't that long since breakfast I passed on food but had the tastiest chocolate milkshake ever before returning to the midday sun with two long sleeved tops and thick winter gloves on to protect my sunburn which seems to be blistering on my hand! All through the ride today I was kept awake by a few episodes of 'From Our Correspondent' on my iPod which I realised I hadn't listened to. 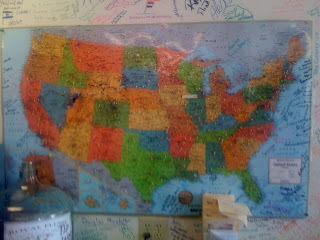 Some of these dated back to last year so it was interesting to hear comment on the US elections before the Iowa Caucuses with the benefit of hindsight. 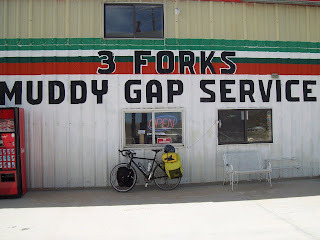 It was an hour or so to a place called Muddy Gap which was just a service station but they sold cold water and ice cream and had wifi so I chatted to a few drivers and idled away an hour there hoping it would cool down in the meantime. It didn't. The last 25 miles were broken up nicely by a chat with a driver who pulled over and offered me a beer or a coke from his coolbox - I must have looked like I was flagging! 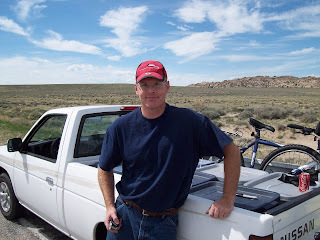 His name was Daniel Hendy and he works as a carpenter having served in Iraq for the last couple of years and he was on the way to Teton National Park for a job. Apparently his son does some riding in mountains but on a unicycle which must be a killer! One can of coke later and I was on my way and will check out Dan's website http://www.sluggotinfantryman.blogspot.com/ (I think that is the right address). 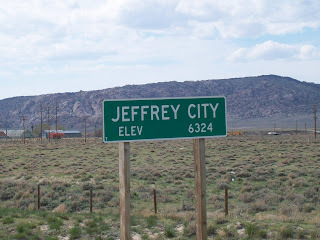 A few miles further and I was at Jeffrey City, my final destination. 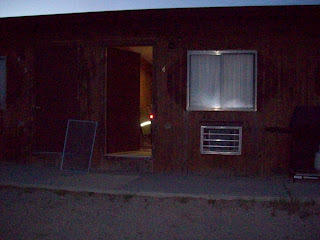 I fancied camping but needed some running water for my sunburnt hand so headed to the motel which was unattended. I wheeled my bike a few hundred yards up the road to the diner and here the freakery began. I walked into what looked more like a dingy classroom than an eatery and a woman grunted in my direction and walked out back to the kitchen. 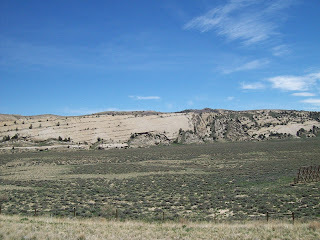 After such a warm welcome I made myself at home, eager to enjoy a slice of this good ole fashioned Wyoming hospitality. After about 15 minutes of being sat there a peculiar hunchback woman dragged herself through the room oblivious to me. I walked over to her and asked for a menu and without answering she shuffled back into the kitchen. She was replaced by an older lady who shouted that "We don't have menus; you can have a burger and fries or two burgers in a bun and fries". After weighing up the smorgasbord of options I opted for the former of this tasty twosome and sat back down eagerly awaiting my feast. The food arrived and was devoured in 2-3 minutes such was its paucity then I had a 20 minute wait for the bill. I asked about the motel and was delighted to find that the hunchback's mother/creator owned it and I was instructed to wait over there. Eventually the old woman arrived, stung me for $40 and gave me the room key. I haven't braved the shower yet but the sink is constantly running and I can't make it stop and the telly only has black and white fuzziness and no sound. 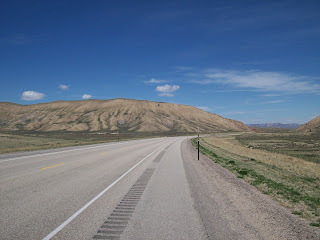 I think an early night is on the cards so I can escape this hole and get 59 miles to Lander tomorrow. Interestingly enough, this town used to have a population of over 2000 people when it had a thriving uranium mine but that was closed several years ago. I think I know where the makers of "The Hills Have Eyes" got their inspiration from. Bloody monsters. 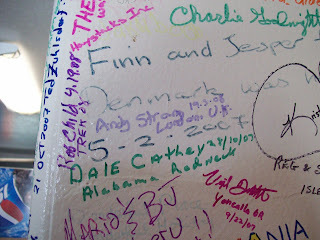 By the way, the pic at the top is from Muddy Creek Service Station where you can sign the wall and put a pin in the map of the USA to show where you have come from. Hope you are back home and well, I have friend in St Andrews so maybe we can ride across England! You met th great Slugo? You just happened to meet the greatest guy in the whole USA what a trip to ride you must be most worthy of being Slugo's friend. However, he is easy for people to make him a nickname quite the character. I know him as others do by another name, he also didn't tell you he volunteered leaving 4 kids at home for the UN Peace Keeping Mission in Yugloslavia and was a police officier in three states. He dodged sniper fire and IEDS in Iraq, built fortreses in Iraq yet patroled in the presence of thousands in the cities carrying his M4 M16 machine gun. For him to offer you a coke you must understand you are most worthy and if in need he was there. Like an Angel of God to so many. Just to think of all your trip you met him in the middle of nowhere man. Well any friend of his is a friend of mine so if he rides (even if I am a disabled Vet) I will be there and buy you a beer! Then we shall go off riding though I may find me a motorized bike LOL; to go to our place and see about reclaiming Hendy Scottland. I think we can ride across England! I'll try to put the beer for you in the buget now from our business he works with me on occasion when we have money from : http://www.supersafety.com Hendy companies.